University of Lynchburg’s annual Night at the Movies concert will bring audiences into the cockpit for a lesson on the history of aviation through film and music. 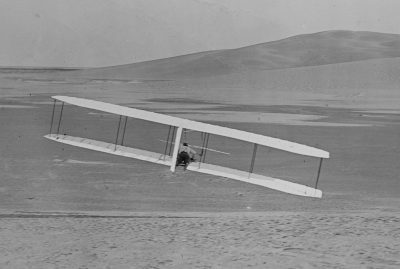 “Taming the Perilous Skies” will use music and movies to present the history of aviation, beginning with the Wright Brothers. The Wind Symphony and Orchestra and Community Big Band will present “Taming the Perilous Skies: The History of Aviation Through Music” at 7:30 p.m. on February 21, 22, and 23 in Sydnor Performance Hall. The concert will use video clips and live performances of music from as The Spirit of St. Louis (1957), The Tuskegee Airmen (1995), and The Right Stuff (1983) to portray the drama that accompanied the history of flight, from the Wright Brothers’ first successful flight to the beginning of the space age. Tickets are free and can be reserved by calling 434.544.8344. The aviation concert concert will be accompanied by a display of aviation-related memorabilia in the Flint Family Lobby of Schewel Hall. In addition to World War I materials, it will include several model planes owned by Nathan Estes ’20, a clarinet player who will be performing in the concert. 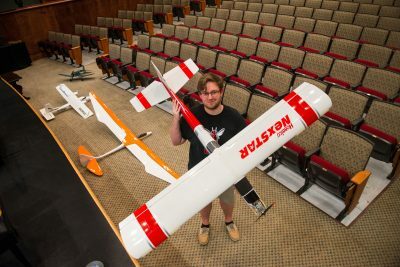 Nathan Estes holds one of the model airplanes he hung in Sydnor Performance in preparation for the Night at the Movies concert. “I was always fascinated by aviation ever since I was a child,” Estes said, recalling how he used to play with a remote control airplane hs grandfather owned. Following in his grandfather’s footsteps, he has amassed a collection of about 100 model airplanes in various stages of completion, including about 40 that are in flying condition. His items on display for the concert will be an F4-U Corsair, a micro B-29 Bomber, and a 1/144 scale model of the Saturn 1B rocket, a test vehicle used in early Apollo missions. This is Lynchburg’s tenth annual Night at the Movies concert, which Dr. Hatcher created to engage more students and other members of the campus community. The format each year is similar, but each features changes that make the experience unique. “Dr. Hatcher raises the bar every year, and this show is incredible,” said Leray Wingo ’19, who has performed in the Night at the Movies Concert since even before she was a Lynchburg student. “This year’s theme of aviation proves to be challenging musically, but deeply rewarding. The music and accompanying film bounce between whimsy and heart-wrenching, triumph and defeat, and offers something for everyone.